After an initial release on iOS and Android devices, Battle Nations has officially launched on Steam, giving a whole new set of players the chance to get in on the tactical, turn-based combat experience. The game was released in beta on Steam via the platform’s Early Access program earlier this year, but this official launch introduces new content to gamers, as Valve and Z2 have partnered to bring Team Fortress 2 content to the game. In Battle Nations, players balance the use of resources as they build a base, constructing a barracks to train soldiers, defensive weapons to protect their land, production facilities for resources like stone and logs, storage structures to hold those resources and so on. Players can recruit units with free and premium currency, with units coming in multiple forms, from basic troopers to shock troopers, grenadiers, flame troops, rangers, hornets and more. During combat, players take turns against the enemy’s army on a battlefield grid. Users tap on one of their units to view their available targets (the selection depends on their distance from the enemy and that unit’s particular skills), and then tap on the enemy unit they’d like to attack (again, this varies depending on the unit’s positioning and skills). Players win resources, including occasional free troops, when they’re victorious in battle, and their troops will level up with skill points automatically after combat. Players are encouraged to complete missions to progress through the overall story, and player vs. player battles are also available. With this official launch on Steam (which includes cross-platform support for progress syncing), users have access to new units and story missions themed after Team Fortress 2. We had a chance to chat with Battle Nations’ lead game designer Alex Arnot, to find out what this means for the game. Inside Social Games: If this Steam version is the first time a user has tried Battle Nations, what should those players know before going in? Alex Arnot: Battle Nations is awesome, and it’s only going to get even more awesome as a result of our partnership with Valve and Team Fortress 2 to celebrate the worldwide launch of Battle Nations on Steam. 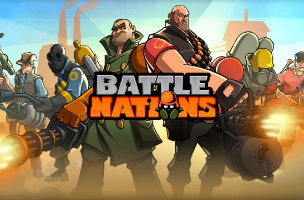 Battle Nations is known for its entertaining and hilarious storyline; it’s an aspect of gameplay that the Z2 team takes a huge amount of pride in. The game features a diverse cast of characters and a humorous, engaging storyline. Players can delve through hundreds of missions in their journey to enlist a powerful army and fight each other in Battle Nation’s unique tactical, interactive turn-based combat. We also have over 200 unique units that players can enlist and take direct control of on the battlefield. The sheer number of units with unique abilities adds a limitless depth of strategy as players build the best battle formations possible. With the expansion to Steam, players can now play the game from a wide variety of platforms. They can start their game on their PC with Steam and when they’re running errands, continue their game while connected to their mobile device. The entire Battle Nations game is available for you to play, whenever and wherever you want to experience it. ISG: What are some of the unique abilities associated with the Team Fortress 2 units? AA: Fans of Team Fortress 2 will recognize favorite characters who have been carefully incorporated into Battle Nations – from their colorful personalities to powerful abilities and specialized tactics, which have been reimagined for Battle Nations. Team Fortress 2 characters have a wide variety of moves at their disposal that you can deploy on the battlefield, dominating the competition in single-player missions and player vs. player battles. Here are just a few of the Team Fortress 2 character’s unique abilities that you can experience first-hand as they fight for you in Battle Nations.